Does Kicker count as part of the CMC? Grixis776 modern goblins doesn't run either. Goblin Bushwhacker / Reckless Bushwhacker are the lords. Travis15973 Hey, sweet deck! I’m not super sure how or if I can help, as my brewing history with B/R in Modern is pretty limited to super-grindy midrange decks. That being said, let’s plunge right into it! I think the main thing to consider with this deck is which way you want it to go. 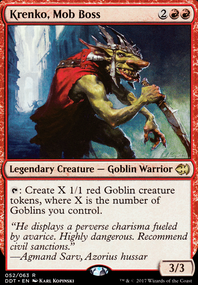 For example, the inclusion of Fireblade Artist and Judith, the Scourge Diva leans in a more Aristocrats-esque direction, while Goblin Guide and Goblin Bushwhacker suggest a more 8-Whack style of play. I would pick one theme and build the entire deck around that, as there are tons of ways to build aggro and so focus is key. Spike Jester seems really weak for Modern. I’d replace it, just because it’s super outclassed by many of the common two-drops ( Tarmogoyf , Thing in the Ice Flip)) and dies to literally everything, without any extra incentive as a sac outlet. 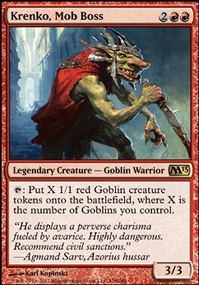 Likewise, while I personally love the card Guul Draz Vampire , I don’t think it’s particularly good, just because the situations where it will be a measly 1/1 are more than you think, particularly if the opponent manages to stabilize and pick off the rest of your guys. And then fill in the rest as you see fit. The meta changes depending on where you are, as the local meta might favor Jund or Jeskai while another might favor Dredge or Tron. I hope this was of help (and I’m sorry if it wasn’t). Feel free to ask any questions if I wasn’t clear on anything. If you're willing to drop some funds for a single card then consider Food Chain ? It's a one card infinite Kobold token combo with Prossh, by repeatably exiling Prossh for mana and then casting him from the Command Zone. Cards such as Squee, the Immortal and Eternal Scourge can be cast from exile allowing you to exile them with Chain to make mana, then cast them again and keep doing this for infinite mana. The infinite tokens combo is the piece you want for a win condition with several cards here. Zulaport Cutthroat and Blood Artist make all your opponents lose all life because Prossh is a sac outlet. Purphoros, God of the Forge , Impact Tremors , Goblin Bombardment make all your opponents die from damage. Anger (only if you have easy ways to get it into your graveyard), Ogre Battledriver , Rhythm of the Wild are good to give all tokens and Prossh haste. 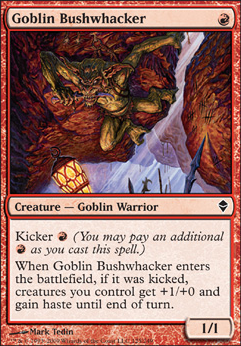 Another way to give everything haste and a pump for a turn one kill is Goblin Bushwhacker . Smothering Abomination lets you draw a lot of cards from sacing tokens. Skullclamp is also excellent as draw with tokens. If adding Chain then you'll need ways to find it. Necropotence , Diabolic Intent , Demonic Tutor , Dimir Machinations (transmute), Gamble are ways to tutor or draw it that won't break the bank. Plunge into Darkness , Demonic Consultation , Tainted Pact (with only one basic land of each type) are other instant ways to find Chain, but you exile all other cards until you find it. Sensei's Divining Top and Sylvan Library help to find/draw Chain or other cards as well as to help setup these spells that let you find one card exile the rest. If Chain or another combo piece is destroyed then you'll want ways to recur it Eternal Witness , Regrowth , Noxious Revival . Mana Vault is the least expensive price of the other powerful mana rocks. Welcome to EDH. Before I begin giving you suggestions about this deck I just wanted to let you know a little about the EDH format.1) EDH decks usually have about 36+ lands and some additional mana sources. 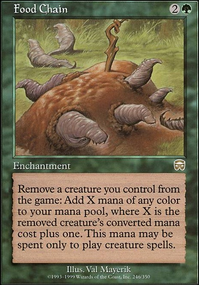 I see you are running Cultivate and Kodama's Reach as well as a few artifact mana sources, but you will probably need to up your land count. 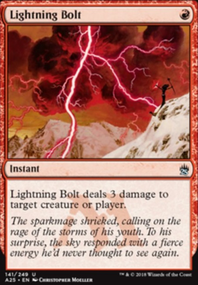 2) Most EDH decks that use their commander use Lightning Greaves and Swiftfoot Boots as ways to protect it and to give it haste so it doesn't just dies every time you cast it. For mana sources Ashnod's Altar and Phyrexian Altar are great in your deck. You can add Poison-Tip Archer to the group of cards that do damage when a creature dies. Viscera Seer is a great sac outlet. Skullclamp is a great source of card draw, especially in this style of deck. Atarka, World Render I know your general is a dragon, but not really many other things in your deck are, so this might be a bit of a win-more card. 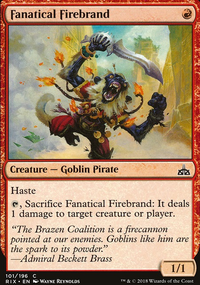 Beastcaller Savant you can get better acceleration somewhere else 1/1 creatures don't stick around long. Burning-Tree Emissary 2/2s get outclassed quick in EDH and you aren't trying to storm. Goblin Bushwhacker one time effect, then not much. 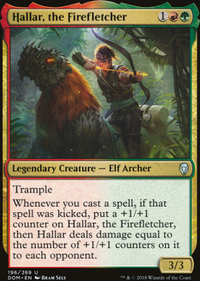 This wants to be a Craterhoof Behemoth or at least an End-Raze Forerunners . Kalonian Behemoth big creatures are big, but not sure it does much in your deck. Gets some Lightning Greaves or Swiftfoot Boots and build your own. Phage the Untouchable a great creature and a lot of fun, but probably better in another deck. Riftsweeper I don't think this works the way you think it does. Autumn's Veil situational based on your groups meta. Titanic Growth +4/+4 might be nice in some cases, but I'm sure it is worth the slot, most things that are trying to kill your creature will probably still kill them after the pump. Explore up the land count to make this matter. Mana Cylix run better fixing so you don't need to filter your mana. Hope this helps. I like your take on Prosh with tokens looks like a lot of fun. Thank you for the suggestions SpookyFluff! Some of those cards are unfortunately uncommon so I can't run them in this but Goblin Bushwhacker is something I will definitely consider! TheGeneralAdvisor thank you very much for your considerations, you have given me a lot of food for thought. I agree with your view that Wheel of Fate probably doesn’t earn the place. The more tuned the deck has become, the more suspend has been situational (need to cast it in the first few turns otherwise it’s a dead card). This might be a good cut to try Apex of Power . My only reservation is ten mana is a significant investment as would normally be expecting to win (or have been knocked out) by then. Certainly worth trying though! If I could afford a Gauntlet of Might I would definitely swap out Extraplanar Lens . I have lost count the number of times that it has ramped me to a win when the early game had been thwarted. I also plan to pick up a Grim Monolith just to tune/speed the deck up a bit. Goblin Bushwhacker is always cast for its kicker cost as a 2-mana, single turn haste enabler to combo off. 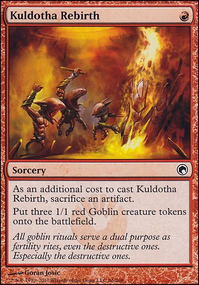 Goblin Ringleader is a holdover from when it was more tribal based deck, and your probably right it needs removing. Moggcatcher is there to tutor up Skirk Prospector or one of the haste enabling goblins. With this list’s lack of tutors, I would definitely think she earns the spot to stay. I used to run Aggravated Assault , but took it out to lower the curve. Now that the deck has lots of ways to produce infinite mana, I think it may be worth testing again. I have tried Anger but could never consistently get it in the bin and don’t have space to dedicate for it to work. Hopefully a more efficient haste enabler than Ogre Battledriver comes in time and I will drop it. I love the idea of extra turns, it’s not something I have given any thought to. I have picked up both Final Fortune and Last Chance and will start playtesting! Thank you so much man, your comment was awesome!